I would add a special thanks to Rich who not only set around half the routes but also prepared all the route cards and the “Rules”. And to thanks Dave Tonks and Action Outdoors for kindly donating the prizes again this year. And of course, thanks to everyone who competed, for fun or for prizes, or contributed as belayers or spectators. Congratulations to Ethan for being our youngest ever class winner, to Steve M who somehow persuaded the “adjudicator” to allow him to enter as a Beginner but was promoted half way through the evening for being too good for the class – he would have been placed 3rd as an “Expert”! – and to Ali who showed us how to climb Copleston’s two previously un-led problems in style and gained 2000 of his points in the process. So now it’s onward to the summer season! This entry was posted in Indoor climbing on 19/03/2015 by Martin Hore. reminiscences of . . .
attempted in rough seas. Start as for Quoin. beneath ones feet temporarily closes. protect the second on this pitch. and emerge, relieved, into the daylight. way through … drum roll please … Preposterous Tales! for myself what an amazingly unique and surreal experience this route could be. as Mervyn two years previously and stopped at the first ledge I reached. Martin joined me on the ledge. flat hold out on the arete, silhouetted against the sky. handholds or gear placements. Somehow this didn’t seem so bad – either because of my experience caving, or because I was so thankful to have survived the overhang. element, the sun above and the sea below, as I moved up to the long tape loop hanging from the thread hole. Simon says ‘Back and Foot’. I say ‘You can not be serious’. then your back’. I say ‘You can not be serious’. just like on a traverse, did not look like fun. Martin and began taking in, as the latter began his climb to join us. 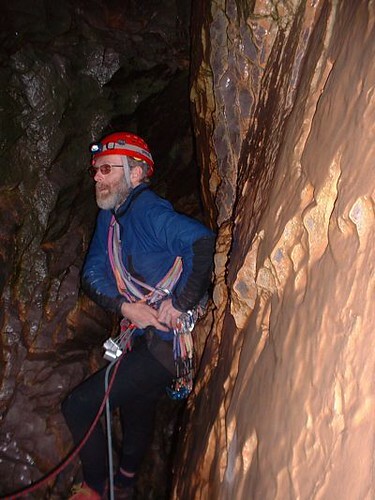 to join us on the belay and then he was racking up ready to set off on Pitch 2. Simon followed on from Martin and then it was my turn. After a few failed attempts I called up to Martin for some advice. ‘Yes,’ I reply, pleased with myself. trying to get to just at the tip of my outstretched fingers. practice would probably been a good idea. asked if I was all right. assures me that there are big holds on a steep wall. precarious traverse across a wet blank face. Later that evening I was asked what my favourite part of the route was. missed it for the world. One day I may even consider another go. This entry was posted in Old articles on 03/06/2005 by Martin Hore. “Ladies and gentlemen, pray silence for “Lob of the Year 2004. “Those of you with long memories, and given to more than average sobriety, may still remember last year’s ‘Lob of the Year’ presentation. Young Mervyn Lamacraft was cruelly denied his rightful claim to the title following a very late and, if I may say so, scarcely noteworthy entry into contention by yours truly, compounded by some highly dubious decision making by one of the most biased juries ever to deliberate on behalf of the IMC. “In revenge it falls this year to me to take on the mantel of judge, jury, chief prosecutor, private investigator and raconteur. “My spies report that a spectacularly early entry into the 2004 ‘Lobbers Diary’ occurred on the 2nd of January. Under crisp and clear skies an assorted party of IMCers were spotted toiling up the slopes from Wasdale Head to the Shamrock face of Scafell. With crampons fixed and axes to hand, fast progress was made up the initial snow slopes. Just as the slope steepened a cry of ‘expletive deleted’ emanated from our esteemed president as his supply of insulin and assorted needles cartwheeled down the snow slope below. Fortunately, after a hasty search and rescue operation by the assembled club members, young Peter was reunited with his fix of the day and a memorable ascent to the summit of Scafell was completed without further incident. “Barely a month later, after a swift flight from Stansted, further winter action was in prospect in the Cairngorms. The ensuing events were recorded by John Buchan in that masterpiece of classic English literature ’39 Steps to Ice Climbing’. I hope John will permit me to quote, somewhat loosely, from his abridged version which appeared in the IMC journal under the title ‘The True Story of Jacob’s Ladder and the Missing Ice Hammer’. ‘Right then the sun broke through the cloud and lit up the most stunning ice and snow covered vista of the weekend. 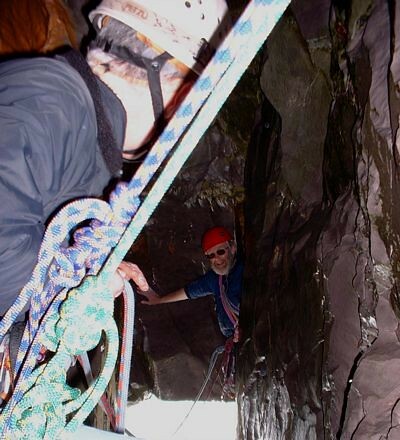 With grins as wide as the corrie we geared up in a flash. The going was steep. 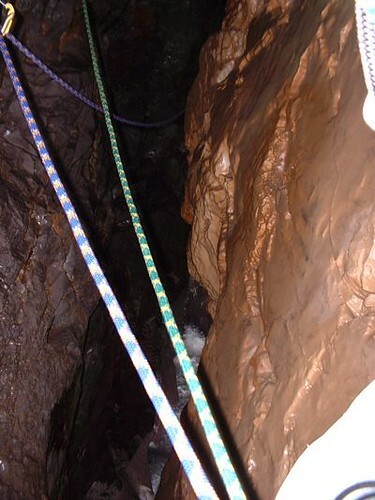 Shaft plunging was the order of the day until a very ‘boney’ rock outcrop about 20 feet up was reached. Very careful pick placements were required as we were soloing for speed and it was a flippin’ long way down. The last 20 or so feet were slightly overhanging rock with a very thin plastering of ice. No way without protection. The alternate exit was a very steep mix of snow and rock, horrendously exposed. As we had no gear this was soloed as well. A stunning climb with a real sting in the tail. “March passed, April too, and no further action to report……. except, yes, a terribly minor indiscretion by your raconteur himself, taking place so far from the prying eyes of the IMC paparazzi that if it were not for his renowned honesty it would doubtless never have come to light. It’s the Easter weekend. Sundry ‘duties in law’ have drawn me across the Atlantic to Boston, and then a few hours north to an obscure bolted outcrop overlooking the village of Rumney, New Hampshire. Four bolts up, a tiny slip leads to a minuscule ‘lobette’, remarkable only for the fact that my companion, no lesser person than the president of the Boston Chapter of the Appalachian Mountain Club, succeeds in simultaneously photographing and belaying my fall. Who says Americans can’t walk and chew gum! “Back to a familiar haunt for the May Bank Holiday weekend – Pembrokeshire. where a gullible Mike Bayley, on his second outing of the year, is well and truly sandbagged into attempting “Chieftain” (VS 4b – going on 5a) at St Govan’s Head. A slip from the polished starting holds is the inevitable consequence, but the resulting damaged ankle and two month lay-off disqualify Mike from contention for “Lob of the Year”, which, may I remind listeners, can only be awarded for incidents in which no injury is incurred, other than to pride and reputation. “Meanwhile, over at Mother Carey’s Kitchen, young Steve Culverhouse is doing battle with ‘Rock Idol’ one of the most unlikely lines to go at E1 anywhere in Britain, taking, as it does, a soaring corner line whose apex overhangs its base by several metres. (As an aside, Rock Idol’s companion route is named, with typical climbers’ humour, ‘Bone Idle’). “At half-height the route steepens alarmingly. Placing a high runner, young Steve moves up left, cunningly avoiding the huge jugs on the right. Steve insists that what followed does not constitute a lob, but as yours truly was lifted off the ground, the verdict must be that weighting of the rope took place. “Apparently the rumours that Carol and Steve were able to make use of the fixed ropes and bivouac gear abandoned by the same pair on Gimmer Crack two years previously are entirely without foundation. This time progress is fast. Their line soon deviates to the right up Gimmer String, and then still further to the right as Steve heads off route across the traverse of Kipling Groove. 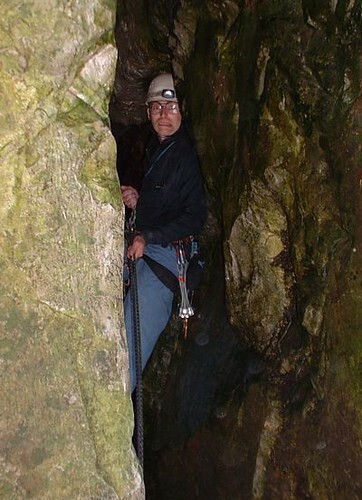 He completes Kipling’s crux moves around the front of the buttress just in time to obtain a grandstand view of the next entry into the 2004 lobbing annals. “It’s Mr Culverhouse again, (audience interjection – ‘Dr Culverhouse’) on the appropriately named ‘Spring Bank’, determined this time to put down a proper marker in this year’s lobbing stakes. He floats up the initial steep slab and fixes bomber gear at the crucial overlap. So far so good. He stretches up for a slanting flake, and up again for a shallow finger pocket. Feet skating on the lip, he falls. A second attempt follows, and a third. The outcome is the same. Thoroughly frustrated he asks to be lowered off, a manoeuvre not without incident, as he is already way out beyond 25m on a 50m rope. “And so it falls to yours truly to complete the route. Even with a free ride to the crux it proves a tough task. ‘Spring Bank’ ultimately succumbs to a team effort, but moral victory belongs once more to the rock in the long-running contest between E2 and the senior members of the IMC. “There now ensued a layoff in reported lobbing over the high summer months, broken only by a further episode in the ongoing disagreement between Simon Chandler and the crux move on the Left Unconquerable. He assures us he’s now got it wired for next time. “Come September, however, there followed a veritable spate of lobbing activity. “First on the scene is Mervyn, back in full swing and up to his old tricks after an enforced early season layoff. The Crag is Black Rocks, the route ‘Birch Tree Variant’, and the lob fairly standard fare for one of our most seasoned exponents of the art. “Next, however, something altogether more spectacular. The venue is again the Unconquerables at Stanage. The challenge on this occasion is the right hand crack, one of the most recognisable and photogenic climbs in Britain. The challenger, our very own president, Mr Peter Krug. I’m reliably informed that what followed developed into an adversarial contest of truly epic proportions, best described as ‘The Unprintable versus the Unconquerable’. According to my source, the lobs were many and spectacular, with air time accompanied by wild flapping of arms in a vain attempt to maintain altitude. Truly, let it be recorded, our man does not give up easily. Top marks for determination, technical merit and artistic impression. “And so through October and November – no further lobbing. Surely the diary can be closed, but no. With the verdict virtually decided, Simon Chandler re-enters the fray on a crisp December Sunday at Stanage, with a final fling on Little Flake Crack. Only an adroit ducking of the head at the vital moment saves yours truly from the scars of an aerial collision with the flying Chandler. “But now, finally, to the verdict of the jury. “First a new departure for the IMC, an inaugural ‘lifetime achievement award’. “A strong contender earlier in the year was young Mervyn Lamacraft who for a short while faced the possibility that he might have made his last entry into the lobbing hall of fame. However, as we have heard, he has since “bounced back” and with good fortune has many lifetimes of achievement still ahead. “So this year’s lifetime achievement award goes to a long standing club member who is sadly not with us tonight. Someone who has made his mark by serving for many years on the committee, by establishing the first club website, and by probably devoting more time to coaching beginners and newcomers into our sport than any other club member. He has now hung up his rock-boots, and we wish him well with his new wife and his narrow-boat. This year’s lifetime achievement award goes, of course, to that veritable legend on his own gear-loops, Mr Keith Lodge. “And so to the Lob of the Year Awards themselves. This year the jury has awarded gold, silver and bronze medals, which I shall announce in reverse order. “In third place, the lob of the year bronze medal is awarded posthumously to Mike Hams……. (that must be wrong….turns sheet over). Sorry, the lob of the year bronze medal is awarded posthumously to Mike Hams’ ice hammer, for it’s irreplaceable role in the saga of ‘Jacob’s Ladder and the missing ice hammer’. “In second place, the lob of the year silver medal is awarded to the young climber who has who has made all the rest of us feel a little older this year with his exploits in the E grades, culminating with his experience at the top of Regent Street. The presentation followed, a photomontage of Pete on ‘Right Unconquerable’, photos courtesy of Caroline Goldsworthy. This entry was posted in Old articles on 05/12/2004 by Martin Hore. a reference to any particular events). take a rest” are not the words you most want to hear at that moment. above, it’s actually called “Falling off less often”. the time it is, and we have. Occasionally it isn’t or we haven’t. then the team will live happily on, probably none the wiser. both happening together is only once in a hundred-thousand climbs. this makes climbing safer than driving to the crag. certainly higher than the once per hundred climbs assumed above. anchors are before deciding whether it’s ‘safe’ to risk falling off. might do it a little less often in future. award – any hopes of a ‘FOLO’ award have definitely evaporated. This entry was posted in Old articles on 04/09/2003 by Martin Hore.